Jimmy & The Hound Dogs are an authentic, 4 piece Rock n' Roll covers band based in the West Midlands. 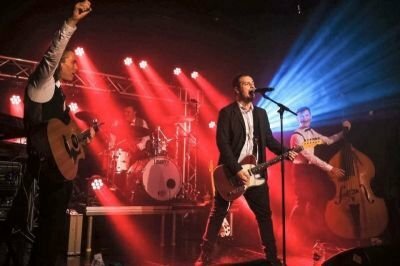 Playing all the hits from Elvis Presley, Chuck Berry, Little Richard, Jerry Lee Lewis, The Beatles, Johnny Cash, Chubby Checker, Bill Haley and The Comets, The Stray Cats and more; The Hound Dogs cover all the classics from the 50's, 60's, 70's and 80's and even put their spin on some modern classics too! This band have modernised the hits you all love with a whole new energy, but still staying true to the original rock 'n' roll roots. A young, fun, energetic band; The Hound Dogs will turn any event into the coolest party in town! Available for general Gigs, Weddings Birthdays etc. if you have an enquiry, please contact us.